What you’re looking at here is the first caudal vertebra (i.e. the first tail bone) of Apatosaurus ajax, the newish specimen NSMT-PV 20375 described by Upchurch et al. (2005). The drawings are all from the plates at the end of that lavishly illustrated paper: all I’ve done is composite them. 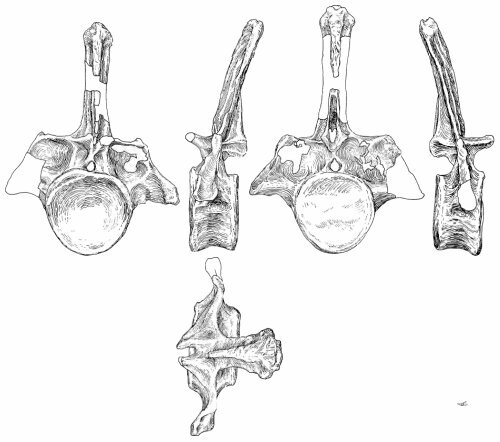 The top row, from left to right, shows the vertebra in anterior, left lateral, posterior and right lateral views. Below the left lateral view is a dorsal view, with the front pointing to the left (as in the left lateral view). Oddly, the size of this vertebra doesn’t seem to be stated in the paper, but two lines of evidence suggest that it’s about 65 cm in total height. First, measuring the caudal on the skeletal reconstruction that is the frontispiece, and comparing with that figure’s 1m scale-bar, yields a height of 64 cm; second, the neural spine’s height (measured from the ventral margin of the poztzygapophyses) is given in Table 9 as 392 mm, and that extrapolates, using the posterior view figure, to a total height of 665 mm. So about 65 cm, then. Oh, yes: also in the picture is your coccyx, that is, the four or five bones that make up your vestigial tail. It is, needless to say, contemptible. It’s surprisingly hard to find a reference for how big it should be, but by cross-scaling from illustrations of whole human skeleton and sacra, I’ve come up with a figure of about 2.5 cm, and that’s what I’ve used here. If you want to compare your tail with Apatosaurus‘s, remember that Apato had about eighty caudals: they diminish in size posteriorly, of course, but they do stay about the same anteroposterior length for much of the tail. In fact, diplodocids have tremendous tails, something like half the entire length of the entire animal. One of my long-standing bugbears is that the biomechanics of sauropod tails gets almost no attention (except for speculations about whip-cracking) compared with the love and care lavished on their necks. One day, one of us might do something about that. That concludes our short but humiliating series of abuse directed at your frail human body. I’ll have to come up with something else next time it’s my turn. Hope you’ve enjoyed the ride. Finally, good news for everyone who was intererested in Matt’s Aegyptosaurus post: he’s made a PDF of Stromer 1932 so you can see that mystery vertebra for yourselves. I knew it was contemptible, but man, 2.5 cm? It’s… it’s like I have no tail at all! I didn’t even see it at first…I had to go back and peek around. I’m so ashamed. We got nothin’. I suppose about the only part of a human skeleton that isn’t ridiculously tiny compared to the corresponding feature of a largish sauropod is the braincase. Your neural spines are spurious. -What kind of metabolism was most probably common for sauropods? -Was there a change of their metabolism when they grew older and larger? -What effects had their masses on their metabolisms? BTW, Darren if you read this, I´ll go today to Tübingen and will try to make some dicynodont-photos. Sauropod metabolism, oh dear oh dear. We’ve discussed this a fair bit among ourselves and at the risk of being controversial I will say…. that all the stuff you’ve read about sauropods being ectothermic or bradymetabolic homeotherms or whatever is speculative and arm-wavy, NOT the good conservative science that many palaeontologists and biologists would like us to think. Given what we now know about dinosaurian growth rates it is difficult to continue to support ectothermy in non-avian dinosaurs, and the data we now have on bone histology, on pneumaticity and on soft-tissue anatomy and posture is more consistent with endothermy than with other physiological models. In fact – despite the fact that it seems to be default assumption among many palaeontologists and biologists – I am not aware of any good reason to think that Mesozoic dinosaurs were ectotherms given that all the usual reasons are erroneous, wrong or untested (e.g., that the Mesozoic world was a stable hothouse (not true), that dinosaurs lacked key structures required for endothermy (erroneous), that some dinosaurs were too big to be endotherms (untested)). I am planning to elaborate on all of this at Tet Zoo some time actually. Meanwhile, I expect others will give more informative answers. Sorry this only partially answers your questions. And yes please on the dicynodont photos, many thanks. Thank you very much for this informative answer, although I really hoped that there is already a bit more known about this issue. BTW I made also some photos of sauropod fingers I will send you too, and just check your emails to see a preview of the dicynodont-photos. I have still an additional question: Is it known how big the hatched sauropods were? I suppose still comparably small, as I can hardly imagine that they would top the eggs of Aepyornis in size, and it seems hard to imagine that they were viviparous or ovoviviparous. Bah! Stupid nonexistant tail! Curse you, coccyx! PO2 falls to 80-100 torr and PCO2 rises to 40-60 torr inside 100-egg man-made Chelonia and Caretta nests. The change in gas tensions in the nest during development is very similar to that seen in the air cell of the chicken egg. […] The rate of diffusion of gases in the sand is 30-50% of the rate found in the nest and 6-12% of the rate found in an equal volume of air. Nest respiratory gas tensions were not greatly different from those in the atmosphere above the ground except after periods of rain. After heavy rain during the last 3 months of incubation the nest became moderately hypoxic (PO2 ~ 100 Torr) and hypercapnic (PCO2 ~ 50 Torr) for several successive days. These short periods of hypoxia and hypercapnia were not lethal. I found and lost :( another abstract that said modest hypoxia retarded turtle development, though. But this alligator article found that 15% oxygen wasn’t a problem. It doesn’t look like anyone has done similar measurements on sauropod nests. There are a bunch on alligators, but I can’t get them. Nathan Miller asked: “how big can an egg be and still allow enough oxygen to the developing li’l darling?” The only treatment I’ve seen of this problem is in R. McNeill’s 1989 book, “Dynamics of dinosaurs and other extinct giants”. Excellent though this book is, it doesn’t provide references, so I don’t know what papers this section is working from, but I know Alexander’s book largely uses his own research, so you might try looking through his publications list. The relevant section is on pp. 156-157 of the book. It doesn’t include numeric calculations, but Alexander concludes that the 9 litre eggs of elephant birds were not close to an upper limit imposed by oxygen diffusion. But he thinks they were close to another limit: much larger eggs may have been too strong for their inhabitants to break out of. There doesn’t seem to be anything relevant on Alexander’s publications page at http://www.fbs.leeds.ac.uk/staff/showPubs.php?staff=Alexander but this only goes back as far as 1992, so that doesn’t mean much. What’s the evidence suggesting sauropod “caudal ribs” were anything more than diapophyses? The chevron facets and chevrons seem to be a much more obvious homologous structure to parapophyses and ribs, though I have no idea what developmental studies have been done on the topic. In adults, the sacral ribs and caudal transverse processes are firmly coossified with the centrum and neural arch, but in subadult specimens these elements are free, and the vertebrae are composed of four ossifications — two median and two paramedian elements (e.g. Haplocanthosaurus, Hatcher, 1903; Camarasaurus, Gilmore, 1825). 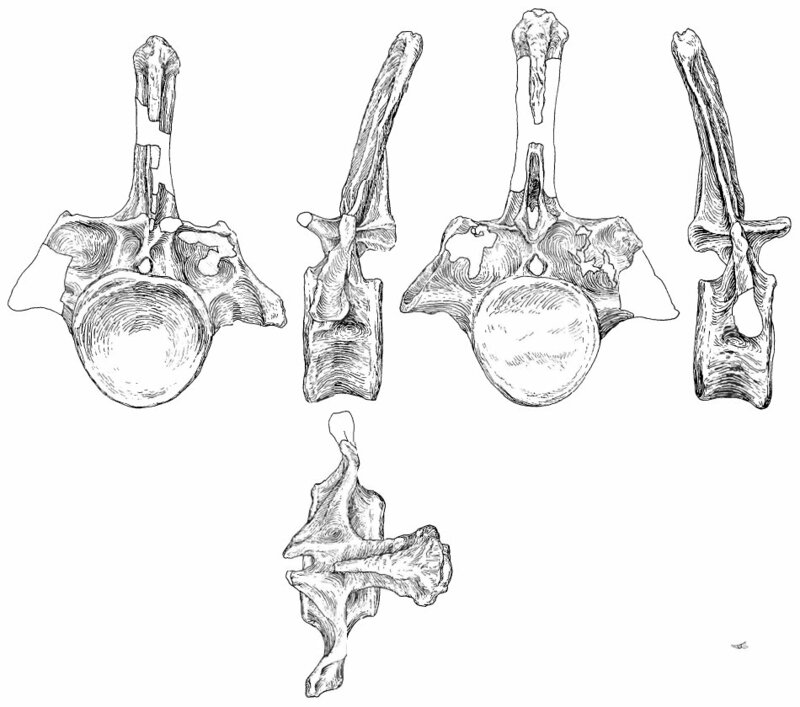 The two median ossifications constitute the vertebral centrum and neural arch, and the two paramedian elements have uncertain serial homologies. In the sacrum, these lateral processes have been identified as either the serial homologues of the parapophyses (Hatcher, 1903) or dorsal ribs (Osborn, 1899), and in the caudal region, they have been referred to as representing fused diapophyses and parapophyses (Hatcher, 1903) or ribs (Huene, 1929:33; McIntosh et al., 1996:84). Unfused transverse processes? Crazy. I’ve never heard of such a thing in theropods, where the transverse processes are fused to the neural arch even in young specimens (e.g. Microvenator, Eustreptospondylus). Apparently Anchisaurus has unfused transverse processes though (Galton, 1976), showing it’s present early in massopod evolution. Wonder what the primitive condition is. Way off topic strictly I guess but in its implications relevant still… what about relative atmospheric levels of O2 and CO2, and atmospheric pressure, in dinosaur days? I can’t help thinking that if they were substantially different from our own ‘norms’ for these, there might be big consequences for our understanding of extinct biology. From pterosaur and teratorn and giant dragonfly airworthiness, to respiratory and metabolic traits, to gigantism… (How come past arthropods so outdid today’s biggest ones… especially on land? I’ve read that spiracle-breathing puts an upper limit on insect size). Because of diffusion? This is mostly a myth. Large insects don’t rely on diffusion; they actively pump their air. (Air sacs: they’re not just for saurischians!) It is true that dependency on diffusion limits the size of insect legs, because they have no way to ventilate them. But if that were the main constraint on their size, they would have found a way around it by now. Big insects face a harder problem: molting. Being big is not so great when you have to shed your skeleton to grow. Spiders breathe through lungs like vertebrates, but they have the same size constraint, fortunately. Who wants to meet a spider big enough to eat sauropods? Happens in phytosaurs and in the archosauriform (?) Doswellia, so the condition is plesiomorphic for Archosauria. So what is it that prevents spiders and insects from getting anywhere near as big as other terrestrial arthropods such as land-crabs? I’m pretty sure it is atmospheric oxygen and the limitations on arthropod gas exchangers. Back in the Carboniferous there were some godawful big terrestrial arthropods, like the awesome Arthropleura–not to mention immense insects like Meganeura, a “dragonfly” with a 75-cm wingspan, and Apthoroblattina, a 50-cm long cockroach. Seems to me that if a 2-meter terrestrial arthropod can molt, then molting is not what’s holding back insects today. It is true that insects can ventilate their tracheae (Westneat et al. 2003), but that doesn’t mean that higher oxygen levels didn’t facilitate arthropod gigantism in the Carboniferous, about which see Dudley (1998). According to Kirkton (2008), bigger insects have to give over more of their body mass to respiratory structures, which implies that atmospheric oxygen is potentially size-limiting for terrestrial arthropods. But I’d be interested in a compelling rebuttal. Dudley, R. 1998. Atmospheric oxygen, giant Paleozoic insects, and the evolution of aerial locomotor performance. Journal of Experimental Biology 201:1043-1050. Kirkton, S.D. 2008. Effects of insect body size on tracheal structure and function; pp. 221-228 in Roach et al. (eds. ), Hypoxia and the Circulation, Springer. Westneat MW, Betz O, Blob RW, Fezzaa K, Cooper WJ, Lee WK. 2003. Tracheal respiration in insects visualized with synchrotron x-ray imaging. Science 299:558–560. Dude, you didn’t read the question. I’m not asking why our feeble contemporary insects and spiders are so much smaller than their antecedents, but why they’re so much smaller than other modern terrestrial arthropods. See also http://en.wikipedia.org/wiki/Coconut_crab which cites typical reports of mass up to 4kg and body-length of 40 cm. Insects breathe through tracheae, which are air-filled tubes–basically diverticula–that go all through their bodies (speculative zoology folks: we await your giant pneumatic terrestrial arthropods). Insects can pump air through their tracheae, but AFAIK they don’t have any dedicated mechanism for getting the oxygen from the tracheae to their tissues beyond simple diffusion. They have hearts and hemolymph, but they don’t seem to have any special interface between the respiratory system and the cardiovascular system (that I know of; please correct me, anyone, if you know otherwise). Land crabs breathe with gills that are rigid enough to perform gas exchange in air. They pump air over their gills on land the same way they pump water over their gills in the water (Burggen 1992). So far, no reason to prefer the crab setup. But the crab cardiovascular system pumps deoxygenated hemolymph through the gills to oxygenate it and then sends the oxygenated hemolymph out to the body from the heart. So the crabs seem to have the edge in gas exchange at the tissue level. I honestly don’t know if that’s enough to explain the size difference, though. Seems weird that insects would never have evolved a way to pipe their hemolymph past their tracheae, which is why I suspect I’m missing something. And the evolution of large size isn’t all about oxygen. There are also issues of feeding, predation, life history, and so on to consider. I know one thing for certain, though: coconut crabs are badass. Burggen, W.W. 1992. Respiration and circulation in land crabs: novel variations on the marine design. American Zoologist 32:417-427. Dude, that’s great. I only have one thing to ask: the next time you decide to answer someone else’s completely different question, please don’t introduce your answer by quoting my question. I have to admit, you make a strong point. Looking back now, I can see that I set out to answer your question but got sidetracked. Funny how the mind works…or fails to. At least it’s not out in the open where everyone can see. Boy, that would be embarrassing! Thanks for that answer, Bill! While we’re on this crazy tangent, I wonder if anyone can answer a follow-up question. Juvenile archosaurs seem to have one ossification for the neural arch and one for the centrum, at least once they get to sizes that fossilize. But a juvenile seal skeleton I have has each vertebra formed of three main pieces- the centrum and two “hemiarches” that must fuse at the median during growth. Is this typically mammalian and/or primitive to tetrapods, and if so, where in the phylogeny did the hemiarches change to the archosaurian single arch? Juvenile archosaurs seem to have one ossification for the neural arch and one for the centrum, at least once they get to sizes that fossilize. But a juvenile seal skeleton I have has each vertebra formed of three main pieces- the centrum and two “hemiarches” that must fuse at the median during growth. Is this typically mammalian and/or primitive to tetrapods, and if so, where in the phylogeny did the hemiarches change to the archosaurian single arch? I think the operative clause here is ‘at least once they get to sizes that fossilize’. AFAIK, the neural arches of all vertebrates start out as paired elements, but they sometimes fuse very early during embryonic development. It is pretty darn interesting that some (all?) mammals only have midline ossifications in the centra, given that those started out as paired elements in evolutionary time. Too bad none of those little sauropod embryos have had any ossified vertebrae. Stingy little bastards. A somewhat off-topic question, while we’re at such things, but I can pull it back on-topic. Almost a year too late, but there are tetrapods, even amniotes like Procolophon, which have proximal caudal vertebrae with both ribs (separate, unfused, mobile ribs) and chevrons. And yes, neural arches, pleurocentra and intercentra are all paired structures that later fuse — “later” being at very different points in ontogeny for different animals, however. Mr. Wedel: “and Apthoroblattina, a 50-cm long cockroach.” Why do you think Apthoroblattina was this big? Heck, I think that 2.5cm is more than we need. Sure can wreck tour day falling on it. I was born with a tail, which was routinely snipt-off, what a pity. Saw a pic in the Enquirer years ago with a Chinese man and his 6yo boy in his arms to show off his 9″ tail. Don’t know how many vertebra would be present for a new born primate.